Q: The Winged Serpent is one of my favorite sleepers of all time. It's full of talent that is severely underrated, and for all of them, it's among their best work. 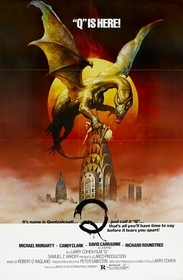 Of course, as a cross between a monster film -- it has hints of being an early 80's version of King Kong--taking place in broad daylight in New York City and a down-to-earth crime drama with a subtle but sly sense of humor, Q's surface appeal is to a select crowd. In fact, most people who brush by the film on the shelves won't even get past the cheesy box art to read the synopsis on the back cover, and if they do get that far, the description -- "It's name is Quetzalcoatl, a dragon-like Aztec god that is summoned to modern day Manhattan by gory human sacrifices. But just call it 'Q,' because that is all you'll have time to say before it tears you apart" -- isn't much more likely to make most folks rent it. But they should. 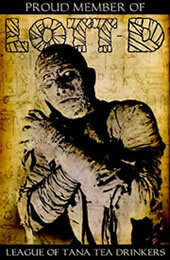 Even if they don't like monster films, have a hard time looking past cheap special effects and can't stomach blood well. Sure, Q has all those elements, and they are among its main attractors for some of us, but the real meat arrives with the excellent performances, the solid script, the fine direction, and every other technical aspect of this film. Q is not only the story of Quetzalcoatl come to roost in the Big Apple because some loony's offering him apple sauce, it's also the story of Jimmy Quinn (Michael Moriarty), a two-bit crook and ex-junkie who gets as much respect as Rodney Dangerfield and who has a hip, frantic be-bop voice and keyboard chops in the vein of George Duke's BeBop Tango with Zappa. It's also the story of a small band of detectives who are trying to deal with both a serial killer and what might be a wave of mass hysteria. Piloting this all is writer and director Larry Cohen, and he is amazing. Cohen has consistently produced gritty, high-quality films that are steeped in poignant drama. He also has a taste for the bizarre, a love for horror and street-smart crime films, and a twisted sense of humor that's never far below the surface. These latter characteristics, along with his bold and admirable embrace of projects with scant budgets are what have cost him wider popularity. Fans of cult films have known about his gifts for some time, however. Q's plot might sound muddled, disjointed, or simple ridiculous. Cohen puts it all together convincingly with style. The cast of Q includes three actors with similar traits -- Moriarty, Davide Carradine and Richard Roundtree. Carradine's the most prolific of the bunch, and despite his consistency, he's been involved with some unfortunate clunkers, and that has hurt his reputation a bit. Roundtree's career has followed a similar path. Despite Carradine and Roundtree's great performances, in my opinion the real gem is Moriarty, a frequent past collaborator with Cohen. Moriarty displays his character actor skills in Q, as Quinn goes from pathetic understatement to panic to megalomania and back a few times -- all without ever seeming ridiculous or overacted and while always retaining a sardonic but likeable humor. As you can imagine, that's not an easy thing to pull off. Cinematographer Fred Murphy does a marvelous job of capturing New York City with a sense of Taxi Driver-like grittiness, but he doesn't only remain in that mode. Q also captures Manhattan's grandeur and a bit of its mysterious side. Murphy also excels at unusual angles and perspectives--more than once I found myself wondering whether an outside scene was filmed in a different city, despite my familiarity with New York. Although some viewers might feel that Q's creature effects are too primitive, in my eyes they have a Harryheusen-ish charm. And to combat possible dissatisfaction with what he knew were low-budget effects, Cohen films "around" them as much as possible, which produces a nice suggestiveness -- say blood or body parts dropped on busy NYC streets rather than showing off computer generated images or something similar. Without a doubt, Q deserves a look by all horror fans and by all serious fans of film, period. What it lacks in bombast (or for horror fans, buckets of blood, perhaps) it more than makes up for in classic storytelling, quality technical aspects and its incredible performances.